I voted for moderators. It's the only thing that would let me come back more often to this strange little world that I seldom visit now. Try spending time away from here like I did, then return and you'll quickly see the few people who try to turn it into a cesspool. I actually feel just a few members who contribute little but have no trouble getting in your face, Ralph, kakakuma et al. and who constantly incite trouble should be permanently removed. It would be a better place. Just my opinion. No offense Chris, I still recognize it as a tremendous resource to the digital community, just too bad there is so much baggage here. Happy new year! I should clarify. 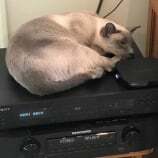 Want to stream my own files via local network from streaming device to DAC. Files stored locally on server or NAS. Not interested in Roon. I use a conventional server with onboard music feeding my USB DAC. JRiver is the music player, loaded with Acourate filters. Upsampling most lower res (16/44 etc) files to 24/176 or 192. No DSD files. I'd like to experiment with a simple streaming setup (maybe Sonore or SOtA) but don't have any experience here. Is it possible to assemble a simple streamer setup that will still accomodate the Acourate filters, keep JRiver or at least have a good player with remote capabilities and good library management? Any specific recommendations would be appreciated. Neither. I'm sure @lmitcheknows who I'm talking about. Not disagreeing, but this is interesting in light of what Larry told me just a few weeks ago. I have the previous DC-ATX unit and asked him about sound quality improvements with the 400 watt unit. He said there are no differences in SQ, the 400W was designed only to provide more power. My impressions from dealing with Larry on several products in the past few years is he does not design specifically for sound quality at all. He has also said that about the different versions of his LPSs. There are some users (forget if here or elsewhere) that say HDP products do not compare favorably with some other high end ones known to the audiophile community. But I am intrigued to hear that someone says that maybe this is not the case. Best way to compare two releases of same work? You can run them through foobar's (or other) dynamic range plugin to see that aspect. Changes between DR can indicate a different mastering. EAC can give you overall levels referenced to 0 dB. Would be nice if this technology resulted in a full sized higher power LPS, say, a JS -2 replacement. Doesn’t mean much to musicophiles. Not on the list of places to buy music. scan, can you mention what changes you made? I've used a Vega in many configurations and almost always heard the differences. Downstream components need to be of sufficient quality/resolution to detect these differences. Or, you're listening for one thing, but the difference is elsewhere, or not listening for a long enough period to make comparisons. I'd guess you were shut off because you were a bit rude and complaining too much. I use JRemote with no problem so don't get what your issue is.